2002/03 WAS AN AMAZING TIME for Chicago tenor saxophone legend Von Freeman. He celebrated his 80th birthday with a concert at Chicago Symphony Center, was honored with a Doctorate of Fine Arts by Northwestern University, was chosen one of the “200 Artists Who Made A Difference In the Last 20 Years” by Jazziz and had Chicago’s 75th Street named after him (“Von Freeman Way”). The Great Divide represents the peak of Freeman’s recorded output for Premonition. 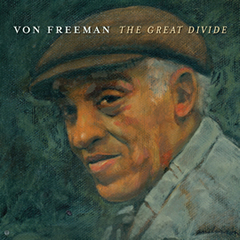 A tribute record to jazz giants Lester Young, Coleman Hawkins and Charlie Parker, all of whom Freeman knew and/or worked with, the album received fulsome praise from the jazz and music press and led directly to the singular achievement of Freeman’s career when he was recognized as a 2012 NEA Jazzmaster. This LP version leaves off several tracks that appeared on the CD but is careful to preserve the direct “tributes” as outlined by Freeman in the extensive liner notes. An incredible album, from an important artist, on LP for the first time.